What are student shields, characters, trophies, and certificates? Students in grades K-8 can earn achievements in each subject: Math & Reading/Language Arts. Silver Shield: For every 150 minutes a student spends working in Classworks instruction, a student will earn/unlock a silver shield. Once 150 minutes is reached, the timer begins for the next 150 minutes. Gold Shield: Once a student has received 5 Silver Shields (750 min. total time-on-task), they receive a Gold Shield and the Silver Shield Display is reset. The student will receive a printable certificate. The teacher will be able to print out a Classworks certificate to display/give the student to mark their achievement. The shield can be accessed from the Student Dashboard under My Scores by clicking the “View Progress” button. When a student achieves 150 minutes time-on-task in a subject, Classworks determines the overall mastery level of that subject. If the overall mastery percentage is 70% or greater at the time that the 150 minutes is reached, a character will be earned/unlocked for the student. If the student has not earned any characters, there will be no image displayed in their My Scores page. When students earns all 5 characters in a subject, and they meet the requirements where they would earn a 6th, they will earn a Gold Trophy instead and the characters will be reset. Teachers can also print a certificate of achievement for students right here in our Help Center! This can be used to recognize any student's accomplishments in either subject, at any time, regardless of their current progress. Click here to find our blank certificates! We also offer a certificate that can be printed out and awarded to All Star Teachers! That's right! We also want to give schools the ability to print a certificate to recognize teachers that are great Classworks advocates! Click here to find the teacher certificate! A star will display beside a student's name in the Teacher Module when a student has new accomplishments in their Trophy room. You can find the star next to a student's name either from the Classes tab or the Individualized Learning tab. 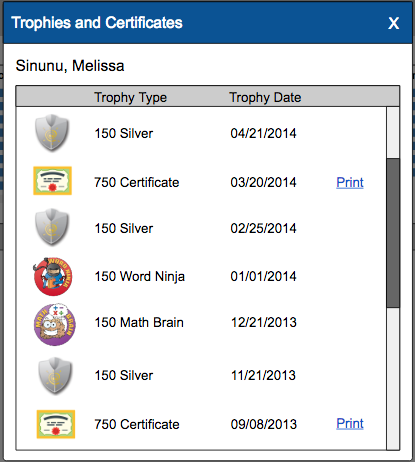 Click on the gold star when you are ready to view the new accomplishments for a student. Note: The star will be gold when there is a new achievement, but will gray out after the first time you click to view. You can click on the gray star at any time to access the trophy room. Certificates are printable. Click the Print link out beside a certificate to print it. 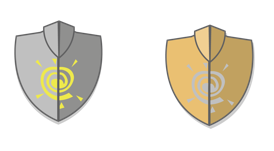 Explain to your students how they earn shields and characters. Set expectations as to how often they can view their Badges Widget during a class period. Create a bar graph in your classroom that displays the number of shields and characters your class earns or that each student earns. Make it a competition! As students earn certificates, print two copies - One to send home to parents and one to display on your classroom bulletin board. Encourage students to do their best in Classworks! 1) Click the drop-down arrow next to your name and choose Administration. 2) Click on the Utilities sub-tab. 3) Click on School Settings on the navigation bar to the left. 4) Click on the name of the school. 5) Deselect the Incentive Program.